Senarmontite: Mineral information, data and localities. Named by J.D. 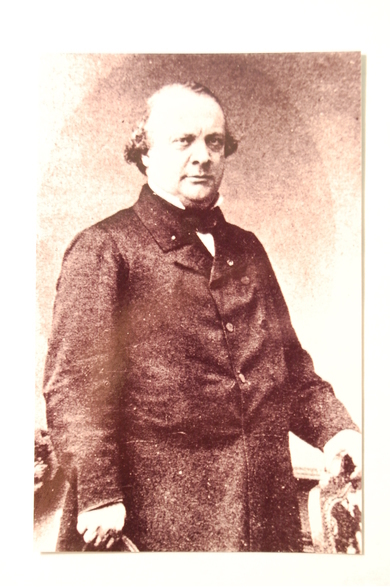 Dana in 1851 in honor of Henri Hureau de Sénarmont (6 September 1808, Broué, France – 30 June 1862, Paris, France), Professor of Mineralogy, School of Mines, Paris, who first described the species. De Sénarmont also made significant contributions to the study of polarization and demonstrating the anisotropy of heat diffusion in a crystal. 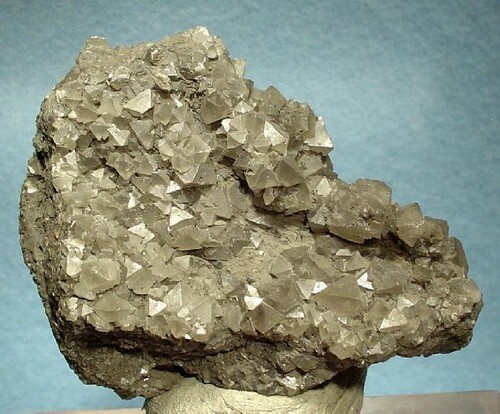 This page provides mineralogical data about Senarmontite. Strong anomalous anisotropism, sectored or zoned. Octahedral crystals, modified by cube and dodecahedron. Stibnite 21 photos of Senarmontite associated with Stibnite on mindat.org. Valentinite 19 photos of Senarmontite associated with Valentinite on mindat.org. Kermesite 13 photos of Senarmontite associated with Kermesite on mindat.org. Baryte 10 photos of Senarmontite associated with Baryte on mindat.org. Celestine 6 photos of Senarmontite associated with Celestine on mindat.org. Stibiconite 6 photos of Senarmontite associated with Stibiconite on mindat.org. Tripuhyite 6 photos of Senarmontite associated with Tripuhyite on mindat.org. Chert 4 photos of Senarmontite associated with Chert on mindat.org. Antimony 3 photos of Senarmontite associated with Antimony on mindat.org. Quartz 3 photos of Senarmontite associated with Quartz on mindat.org. de Senarmont, H.H. (1851) Note sur l´antimoine oxydé naturel de forme octaédrique. Annales de Chimie et de Physique: 31: 504-507. Dana, J.D. (1851) Mineralogical Notices. No. III. 1. New species. Octahedral oxyd of antimony. American Journal of Science and Arts: 12: 205-222. Dehlinger, U. (1927) Über die kristallstruktur der antimonoxyde. Zeitschrift für Kristallographie: 66: 108-119. Hocart (1934), Bull. soc. min. : 57: 90. Palache, C., Berman, H., Frondel, C. (1944) The System of Mineralogy of James Dwight Dana and Edward Salisbury Dana Yale University 1837-1892, Volume I: Elements, Sulfides, Sulfosalts, Oxides. John Wiley and Sons, Inc., New York. 7th edition, revised and enlarged: 544-545. Mason, B., Vitaliano, C.J. (1952) The mineralogy of the antimony oxides and antimonates. Mineralogical Magazine: 30: 100-112. Welin, E. (1968) Notes on the mineralogy of Sweden 6. X-ray powder data for minerals from Långban and the related mineral deposits of Central Sweden. Arkiv för Mineralogi och Geologi: 4: 499-541. Svensson, C. (1975) Refinement of the crystal structure of cubic antimony trioxide, Sb2O3. Acta Crystallographica: B31: 2016-2018. Zav'yalova, A.A., Imamov, R.M. (1975) About the structure of the cubic modification of Sb2O3. Soviet Journal of Coordination Chemistry: 1: 1186-1188. Whitten, A.E., Dittrich, B., Spackman, M.A., Turner, P., Brown, T.C. (2004) Charge density analysis of two polymorphs of antimony(III) oxide. Dalton Transactions: 2004: 23-29. Hålenius, U., Hatert, F., Pasero, M., Mills, S.J. (2015) IMA Commission on New Minerals, Nomenclature and Classification (CNMNC) Newsletter 28. New minerals and nomenclature modifications approved in 2015. Mineralogical Magazine: 79: 1859-1864. The following Senarmontite specimens are currently listed for sale on minfind.com. Bernard, J.H. and Hyrsl, J. (2004) Minerals and their Localities. Birch, W. D. (2015) Native antimony from Inglewood, Victoria. Australian Journal of Mineralogy Vol. 17 #2, 88-90. Dr Yohachiro Okamoto collection (curated at the Geological Museum, Geological Survey of Japan). Canadian Mineralogist Vol. 18, pp. 329-332 (1980); WILSON, W.E. (1991) The Lake George antimony mine, New Brunswick. 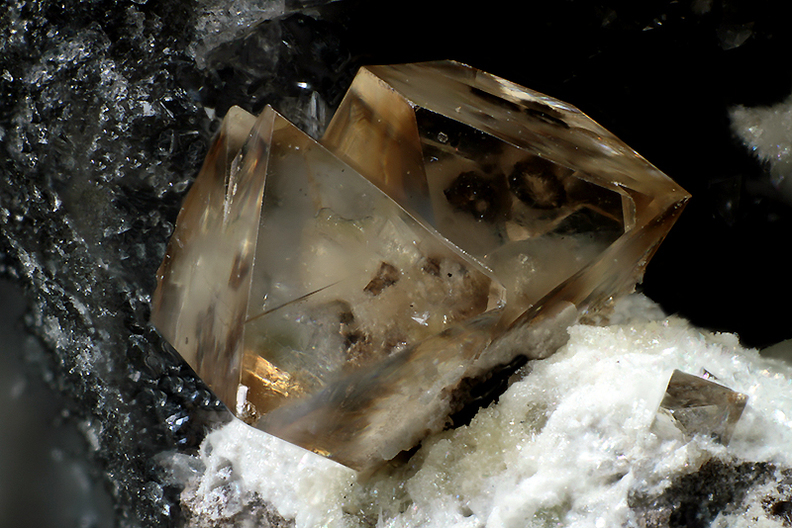 Mineralogical Record 22, 263-267. Ottens, B. (2006): Lapis 31 (2), 23-34; Ottens, B. (2007): Mineralogical Record 38(1), 3-17. Pauliš, P.: Několik nových mineralogických nálezů na území České republiky, Minerál, 1993, roč. 1, č. 4, s. 25-26. Habermann, V. (1995): Minerál, 3 (2), 121-122; RÜSENBERG, K. A. & PAULIŠ, P. (1996): Umbildungen und Neubildungen in den Schlackehalden der Blei- und Silberhütte von Příbram/ČR. Aufschluss 47, 267-287 (in German). Fojt, B., Kopa, D., Skácel, J.: Paragenetická studie výskytů As-Sb asociace ve staroměstských pásmech I. Hynčice pod Sušinou. Časopis Slezského muzea, série A, vědy přírodní, 1977, roč. 26, č. 1, s. 1-20. J.-J. Périchaud: Les Minéraux d'Auvergne, Vol. 1, Clermont-Ferrand (1985). Bernardini, G.P., Cipriani, C., Corsini, F., Mazzetti, G., Parrini, P. (1982-1983) Le collezioni del Museo di mineralogia di Firenze: III) arsenico, antimonio, bismuto. Rendiconti della Società Italiana di Mineralogia e Petrologia, 38, 177-189. Chauris, L. (2014): Minéraux de Bretagne, Les Editions du Piat, 140. FLUCK, P. & STEIN, S. (1992): Espèces minérales des principaux districts miniers du massif vosgien. - Pierres et Terre 35, December 1992, 120 pp. Pigetvieux, G. (1981): Etude géologique et métallogénique des Aspres (Pyrénées-Orientales), Thèse Faculté des Sciences Université de Franche-Comté, Besançon, 279 p.
Meier, S. (1995). Mineralfundstellen im Fichtelgebirge. Eigenverlag, Marktredwitz, 220 p.
Del Caldo, A., Moro, C., Gramaccioli, C.M., Boscardin, M. (1973) Guida ai minerali. Fratelli Fabbri Editori, Milano, 208 pp. ; Conti - Vecchi, G., Stara, P., (1991) :Minerali della Sardegna.Della Torre editore.Cagliari, 276 pp. Pelloux, A. (1913) Sulla senarmontite di Su Suergiu (Gerrei) e di Su Leonargiu (Sarrabus) in Sardegna. Annali del Museo Civico di Storia Naturale di Genova, serie 3, 6 (46), 19-21; Del Caldo, A., Moro, C., Gramaccioli, C.M., Boscardin, M. (1973) Guida ai minerali. Fratelli Fabbri Editori, Milano, 208 pp. Pelloux, A. (1913) Sulla senarmontite di Su Suergiu (Gerrei) e di Su Leonargiu (Sarrabus) in Sardegna. Annali del Museo Civico di Storia Naturale di Genova, serie 3, 6 (46), 19-21. Brizzi G., Sabelli C. (1985): Minerali di Poggio Peloso (GR). Riv. Mineral. Ital., 8, 4, (4-1985), 135-143; Montrasio A., Sciesa E, Vignola P. (1997): Collezionare minerali. Hobby & Work, Milano, 800 pp. Meli, R. (2000): L'antica miniera antimonifera di S. Martino sul Fiora, Mancianese (Grosseto). Rivista Mineralogica Italiana, 2/2000, 111-113. Bazzoni C., Mangoni G., Capperi M., Bernocchi M. (2011): Montoccoli-Castellaccia: I minerali delle miniere nella valle del torrente Zanca (Grosseto). Riv. Mineral. Ital., 35, 2 (2-2011), 76-89; Costantini A., Pagani G. (eds.) (2015): Minerali: bellezze della natura nel Parco delle Colline Metallifere - Tuscan Mining Geopark. Pacini Editore, Pisa, 272 pp. Rivista Mineralogica Italiana, (1), 1-22. Bardi, T., Biagioni, C., & Orlandi, P. (2009). Aggiornamento sui minerali della Sorgente Solfurea di Micciano (Pomarance, Pisa, Toscana). MICRO (località), 1/2009, 261-276. Brizzi G., Ciselli I, Santucci A. (1988) - Cetineite ed altre novità dalle Cetine di Cotorniano - Riv. Miner. Ital., Milano, fasc. 3, pp.73-82 and Mineralogical Record, 15 (1), 27-36.; Menchetti, S., Batoni, M., Batacchi, C., Borselli, G., Brogi, A., Ceccantini, L., Fassina, B., Marchesini, M., Rossellini, A. & Ruggieri, G. (2015): Le Cetine di Cotorniano. Miniera e minerali. 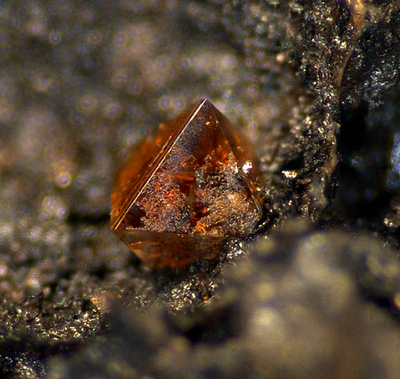 Associazione Micro-Mineralogica Italiana, Cremona, 354 p.
Philippo, S. & Hanson, A. (2007): La minéralisation en antimoine de Goesdorf. Ferrantia 49, 111-146. [http://www.mnhn.lu/recherche/ferrantia/publications/Ferrantia49.pdf]; Bakker, R. and Kolitsch, U. (2010): Die Antimon-Grube von Goesdorf in Luxemburg: das weltweit dritte Vorkommen von Brandholzit. Lapis 35 (6), 30; 43-45; 70. (in German); Filella, M., Philippo, S., Belzile, N., Chen, Y., & Quentel, F. (2009). Natural attenuation processes applying to antimony: a study in the abandoned antimony mine in Goesdorf, Luxembourg. Science of the Total Environment, 407(24), 6205-6216. Anthony, Bideaux, Bladh, Nichols: "Handbook of Mineralogy", Vol. 1, 1990; Amer.Min. (1978) 63, 715-719; DILL, H.G. and HORN, E.E. (1996) The origin of a hypogene sarabauite-calcite mineralization at the Lucky Hill Au-Sb mine Sarawak, Malaysia.- Journal of Southeast Asian Earth Sciences, 14: 29-35; Wolfram Dieter Schuh (1993) Geology, Geochemistry, And Ore Deposits Of The Bau Gold Mining District, Sarawak, Malaysia. PhD Thesis University of Arizona. Wilson, N.J., Craw, D., Hunter, K. (2004) Antimony distribution and environmental mobility at an historic antimony smelter site, New Zealand. Environmental Pollution 129: 257-266. Mudrinic, C. & Serafimovski, T. (1997): The Krstov Dol antimony deposit near Kriva Palanka (northeastern Macedonia). In: Boev, B. & Serafimovski, T. (Eds. ): Proceeding of a symposium: Magmatism, metamorphism and metallogeny of the Vardar zone and Serbo-Macedonian massif, Faculty of Mining and Geology, Stip, 169-174. Đorđević, T., Kolitsch, U., Tasev, G., Serafimovski, T. & Boev, B. (2017): Anomalous As-enrichment in gersdorffite in a realgar-rich environment: Lojane, Macedonia. Mitt. Österr. Mineral. Ges. 163, 38 (abs.). ; Kolitsch, U., Đorđević, T., Tasev, G., Serafimovski, T., Boev, I., Boev, B. (2018): Supergene mineralogy of the Lojane Sb-As-Cr deposit, Republic of Macedonia: Tracing the mobilization of toxic metals. Geologica Macedonica 32, 95-117. OT. Ljøstad photo and collection. Kenngott, G. A. (1852): Mineralogische Untersuchungen, betreffend die Minerale Zinkenit, Gyps, Antimonsilber, Kupferglanz, Millerit, Pyrrhotin, Danait und den oktaedrischen Antimon-Baryt. Sitzungsberichte der kaiserliche Akademie der Wissenschaften in Wien der Wissenschaften mathematisch-naturwissenschaftlichen, Classe 9, 557-595.; Sejkora, J., Ozdín, D., Vitáloš, J., Tuček, P., Čejka, J., Ďuďa, R. (2007): Schafarzikite from the type locality Pernek (Malé Karpaty Mountains, Slovak Republic) revisited. European Journal of Mineralogy, 19, 3, 419-427.; Sejkora, J., Ozdín, D., Ďuďa, R. (2010): The supergene mineral association with brandholzite from Pernek, Malé Karpaty Mountains, Slovak Republic. Journal of Geosciences, 55 149-160. Minerals of South Africa; Cairncross, B. and Dixon, R., (1995) Minerals of South Africa. The Geological Society of South Africa. - Calvo, M. (2009): Minerales y Minas de España. Vol. IV, Óxidos e Hidróxidos. Escuela Técnica Superior de Ingenieros de Minas de Madrid - Fundación Gómez Pardo. 752 pp. Stalder, H. A., Wagner, A., Graeser, S. and Stuker, P. (1998): "Mineralienlexikon der Schweiz", Wepf (Basel), p. 367. Kingsbury, A.W.G. (1957) A new occurrence of nadorite in Cornwall. Mineralogical Magazine, vol. 31, n° 237, 499.; Goley, P. and Williams R. (1995) Cornish Mineral Reference Manual. Endsleigh Publications. Kingsbury, A.W.G. (1957) A new occurrence of nadorite in Cornwall. Mineralogical Magazine, vol. 31, n° 237, 499. Fortey, N.J., Ingham, J.D., Skilton, B.R.H., Young, B., and Shepherd, T.J. (1984) Antimony mineralization at Wet Swine Gill, Caldbeck Fells, Cumbria. Proceedings of the Yorkshire Geological Society, 45(1-2), 59-65.; Cooper, M.P. and Stanley, C.J. (1990) Minerals of the English Lake District: Caldbeck Fells. Natural History Museum Publications, London, 160 pp. (referring to Fortey et al., 1984). Pemberton, H. Earl (1983), Minerals of California; Van Nostrand Reinholt Press: 185.
ⓘ Santa Clara Co. ? Goldsmith, E. (1873), Stibioferrite, a new mineral from Santa Clara County, California: Academy of Natural Sciences Philadelphia Proceedings: 25: 369; Murdoch, Joseph & Robert W. Webb (1966), Minerals of California, Centennial Volume (1866-1966): California Division Mines & Geology Bulletin 189: 334.